Olivia and Avery had their eye test on Thursday and they checked out fine. Olivia needs to be checked again in four months and Avery in two. Avery's retina is still imature but getting better. 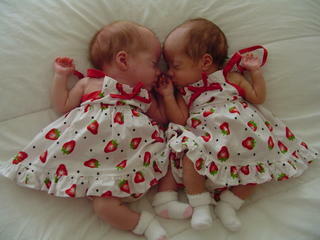 We took the girls out in these dresses given to them by auntie Nicole and we thought they were just adorable in them. They are doing really well and Olivia has finnaly picked up on her feeds. She's waking up on her own now when she's hugry. Posted by Miracles at 2:35 p.m.